Wawel Castle is located on Wawel Hill in Krakow, ancient capital of Poland. Wawel Castle had been the residence of Polish kings for centuries and a site of most important events in Polish history. It is considered to be the symbol of Polish statehood. 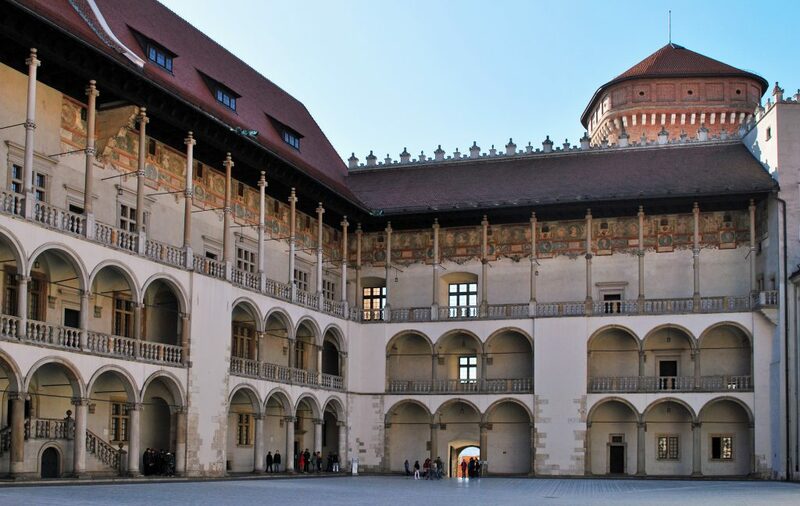 The Wawel Castle is also one of the most beautiful examples of Renaissance architecture in Poland. Its premises now house one of Poland’s premier art museums. 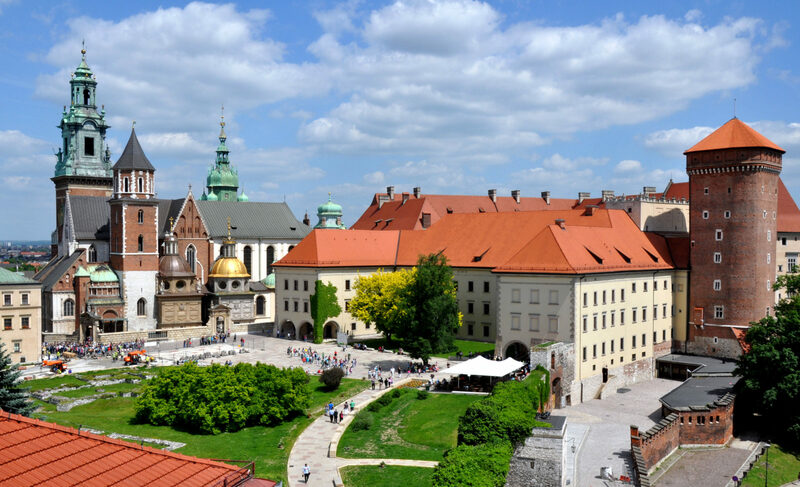 History of Wawel Hill dates back to the beginning of Polish statehood. First historic ruler of Poland, Mieszko I had settled down on Wawel Hill. From then on, the hill had been a place of royal residence. The Castle played an important part in Polish politics and history. The first major rebuilt of the Royal Castle took place under the rule of Casimir III the Great, who reigned from 1333 to 1370. The reign of Casimir III the Great is often defined as the golden era of Polish development, what is undoubtedly reflected in Castle’s architecture. During the rebuilt, the Castle was adapted to be not only the king’s residence but also to house expanding state apparatus. With the beginning of the reign of the new dynasty, originated by marriage of Jadwiga of Poland and Wladyslaw II Jagiello, the Duke of Lithuania, the Royal Castle welcomed the new era of its splendour. During the reign of Jagiellonian dynasty, the castle had been refurbished to reflect current trends. In the early 16th century King Sigismund I the Old and his wife Bona Sforza introduced Renaissance culture to the royal court. Top artists of the era had worked in the Royal Castle. Many of them traveled from the heart of Renaissance and the Queen’s birthplace, Italy. They brought the most recent trends in architecture and interiors. With galleries added around the yard and general refurbishment, the castle was turned into a splendid Renaissance residence. The artistic patronage of King Sigismund is visible in the Wawel Cathedral, where King’s ancestral chapel was built, work of the Florentine artist Bartholomew Berrecci. Numerous of King’s foundations include also one of Poland’s national symbols, the Sigismund Bell. This enormous bell located in the Wawel Cathedral was named in honour of the King. After the north-eastern part of the castle burned down in the fire of 1595, another Polish King, Sigismund III Vasa, ordered the castle’s refurbishment. Fifteen years later though, the capital was moved to Warsaw and Wawel was gradually losing its privileged position as the Royal Castle. With the Partitions of Poland at the end of 18th century and throughout the 19th century, Wawel Royal Castle had seen demolition and occupation. In 1794 Royal Insignia were stolen and never retrieved. 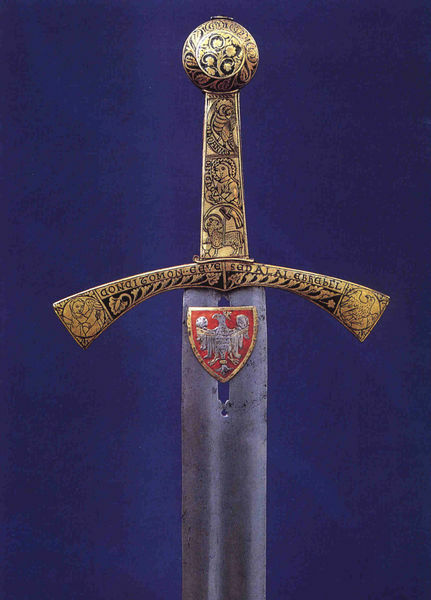 Only Szczerbiec, the coronation sword that was used in crowning ceremonies of most Polish monarchs from 1320 to 1764, was hidden and returned to Poland in 1928. After World War I and regaining of the independence the Castle was given the official status as the residence of the President of Poland. During World War II Wawel Royal Castle was once again occupied and became a residence of Nazi Germany governor general Hans Frank. With the events of World War II, Szczerbiec was evacuated from the Castle once again, where was restored in 1959. The sword is now on display in the Wawel Castle treasure vault. After World War II, restoration works began and the national museum was established in the Royal Castle. 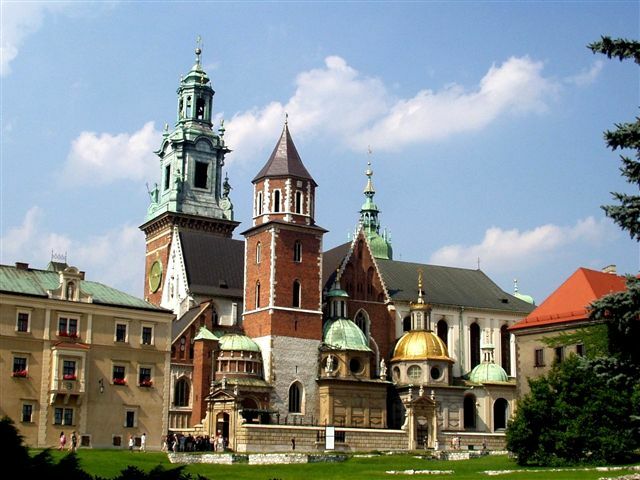 For centuries, the Wawel Cathedral had been the most important place of worship in Poland. It was also the most significant, the richest and the most prestigious diocese. A 1000-years-old Cathedral is a summary of Polish history. In 1320 the Polish King, Wladyslaw the Elbow-high coronation took place here, and from then on, of his successors as well. It was the main burial site for Polish Kings and Queens, and from the 19th century also for national heroes. Construction of the first Cathedral on Wawel Hill began in the 11th century. The magnificent Gothic edifice it is until today was built in the 14th century. The facade and the interior are examples of Gothic architecture. During the course of centuries, eighteen chapels had been added to the nave. Each of them represents different architectural style and each is more sumptuous than the other. One of the most beautiful examples of Polish Renaissance architecture, the Sigismud’s Chapel, is located in the Cathedral. Fourteen Polish Kings were buried in the Cathedral alongside with their wives, countless Krakow bishops, two Polish saints and many other notables, including national heroes Tadeusz Kosciusko and Jozef Poniatowski and two national poets, Adam Mickiewicz and Juliusz Slowacki. 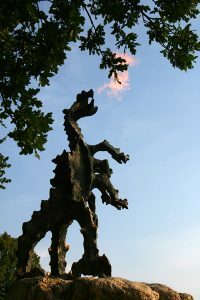 The legend says that the first settlers in Krakow were haunted by a horrific creature – the Wawel Dragon. The Dragon was terrorising people, devouring their stock and virgins. It lived in a cave under the Wawel hill near the Vistula riverbanks. Thanks to a brave Prince, named Krak, who tricked the Dragon, people were once and for all free. The city was named in honour of the fair and brave Prince. The Dragon’s Den has been known for centuries. Polish chronicles mention that in the 16th century the cave was occupied by tramps and prostitutes and in the 17th century a popular tavern was established. Dragon’s Den is now a popular tourists attraction. The cave in which the Dragon was supposed to had lived is a 275-meters long limestone cave located at the foot of Wawel Hill. The tourists’ route is 82 m long. It begins with a 21-meters long spiral staircase, that allows visitors to reach the cave, where they can admire underground paths and lakes. At the exit from the cave stays a large statue of the mythical Dragon breathing fire. It was located there in 1972 and is a work of Polish sculptor Bronislaw Chromy. It is a major tourists attraction in the city, especially amongst children. The Dragon breaths real fire every 5 minutes. Recently, a new service was installed in the statue that makes it even more popular. Anyone can request a special fire blow by sending a dedicated SMS. Wawel Hill is open for visitors every day. April and September 6 a.m. – 7 p.m.
May-August 6 a.m. – 8 p.m.
November-February 6 a.m. – 5 p.m.
* The arcaded courtyard closes 30 minutes before the gates of the hill. Each exhibition in the Wawel Castle Museum has a separate entrance fee. Click here to see opening hours of the exhibitions and ticket prices. Entrance to the Wawel Cathedral is free. Tickets need to be purchased in order to enter Sigismund Bell, Royal Tombs and Cathedral Museum (one combined ticket). Click here to see opening hours and ticket prices.